It is quick-acting to get rid of bees fast. Its ability to expand once dispensed allow you to wipe out the entire nest with one application. It kills pest immediately from a safe distance. Bees present a more immediate threat than other pests because of the risk of allergic reactions. About 100 Americans die from the effects of stings. The sobering reality is that the incidence of insect allergies is rising. Prevention is the best cure if you have a bee problem. However, it’s imperative to act quickly to avoid it escalating to a dangerous situation. Out Top 5 Best Sprays Against Bees 2019 review provides you with the information you need to pick the most effective problem to handle your particular situation. These products have specific instructions for their safe use which are crucial for you to follow. We’ll provide the detail about each one along with some tips for managing this pest issue. Keep reading to learn more and restore your peace of mind with minimal hassle in the safest possible way. How Do Bee Sprays Work? Will They Kill Beneficial Insects Like Honeybees? How Can I Prevent a Bee Problem? You can spray from 22 feet away. It has a residual effect to prevent a recurrence. It is safe to use around electronics because it is electrically non-conducting. It kills the insects on contact. You’ll likely need an entire can for each nest to saturate it thoroughly. It comes in a three-pack. Each can is 14 ounces. 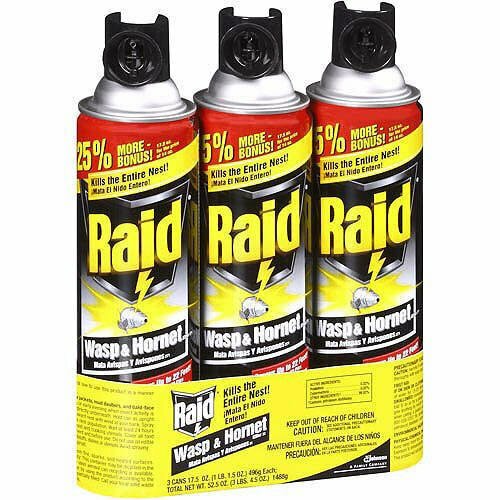 Raid Wasp and Hornet Killer has the outstanding reputation of the manufacturer behind it. The trust is valid. The company developed this product with the consumer’s safety in mind. You can spray it from a distance, and it kills the pests instantly. You have no worries of getting stung. It sprays in a stream for optimal control. The active ingredients are prallethrin and cypermethrin, both of which are highly toxic to fish and aquatic wildlife. Take care to avoid spraying where it may drift into waterways. It kills other pests such as termites and ants. It can expand to get far into the nest. It kills the pests instantly. It works on all life stages of the insects. It has the potential to contaminate groundwater. Don’t use it where there is a risk of contact with electrical equipment. It comes in an 18-ounce can with a dispenser hose attached. Traps Direct 45 Insect & Spider Traps stands out as an economical solution to a vexing problem. The package includes more than enough of them to treat your entire home. They offer a more tactful way to deal with a pest issue with a design that doesn’t draw attention to itself. They come flat in the pack. You can fold them in a triangle or rectangle shape. Like the previous product, they are glue traps. They also include bait to attract more pests to them faster. It is non-conducting for safe use around electrical equipment. It has a residual effect. Permethrin is a Pesticide Action Network Bad Actor which means it is highly toxic and a possible carcinogen. It comes in an 18-ounce can. It sprays up to 20 feet away. SpectracidePRO Wasp & Hornet Killer offer a way to kill bees and other stinging insects fast from a safe distance away to protect you. It has the two qualities we like to see in these products. It acts quickly and has residual properties. It will kill other pests too, making it an excellent value for the price. Its active ingredients are permethrin, tetramethrin, and piperonyl butoxide. All are highly toxic with the first one a concern for humans too. Use this product with caution and follow the instructions precisely. It’s easy to use even if you’re wearing gloves. You can spray it from a safe distance. It has a high non-conductive threshold. It comes in a 16-ounce can. It is non-conducting up to 47,600 volts. 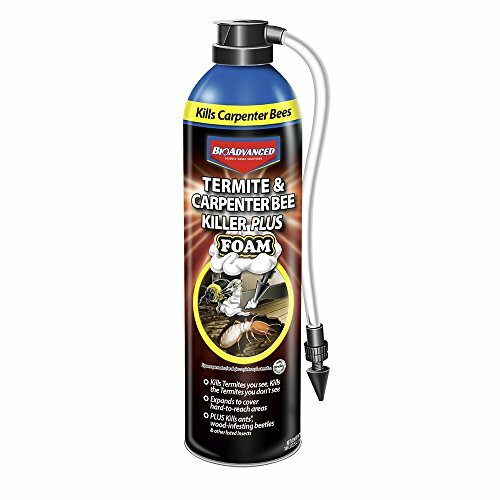 Instant Knockdown Enforcer EWHIK16 Wasp And Hornet Killer provides a safe way to get rid of pests that have taken up residence near wires. You can spray it from up to 20 feet away. The name of the product is appropriate given its quick action. It comes out as a narrow stream which you’ll find easy to direct where you need it even if you wear gloves. The active ingredient is permethrin which, as we discussed above, is a highly toxic pesticide to humans and other organisms including aquatic wildlife. Do not spray on windy days to avoid drift to unintended areas and water sources. It is safe to use on a variety of surfaces including plastic. It is a commercial-grade product. It is a broad-spectrum pesticide that can kill over 50 pests. You have to mix it before using it. It comes in a 16-ounce bottle. 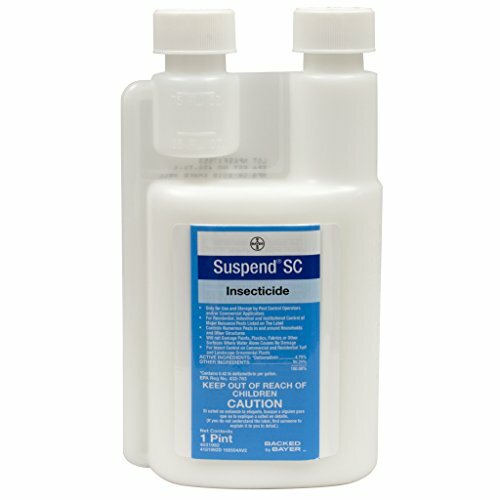 Suspend SC Contact Insecticide is an all-around solution for bees and other pests that make it a decent value even with its higher price tag. It is a concentrate that you can mix to match the insect you want to target. It has a residual effect to, so it keeps on working after you’ve applied it. You can use it on your lawn or anyplace you’re finding bugs. The active ingredient is deltamethrin. It is a refined, third-generation chemical that is highly effective for a wide range of pests. However, it is also toxic to aquatic wildlife. These products often kill on contact. It’s a desirable feature and an essential one. Disturbing a nest without killing them is dangerous as some insects are incredibly aggressive. About five percent of Americans are sensitive to them with symptoms ranging from mild discomfort to life-threatening anaphylaxis reaction. One sting is one thing, but many may be fatal. Many sprays allow you to use them from a distance which you’ll find on the label. That’s another essential safety feature since the bees will likely die before they can fly toward you. They can reach speeds of up to 20 miles per hour which doesn’t give you a lot of time to escape. We strongly urge you to use a spray of this type only. Pay attention to any specific recommendations for the pests for the best results. Bee sprays will have a concentration of insecticides with a proven track record of efficacy. They are EPA-registered with detailed instructions about their correct use as well as precautions and first aid measures. We strongly advise you to read the label of any product you buy before using it. They are potentially harmful if used improperly. On the positive side, they often are useful against other tenacious insects like hornets and wasps. Pay attention to any specific recommendations for the pests for the best results. Ideally, download and read the material safety data sheet which the manufacturer must provide. It will provide other information such as the risks to non-targeted organisms. As we explained above, it’s imperative to use a bee spray as directed. That is the single best way to avoid unintended consequences such as accidental exposure. Stick to all of the recommendations such as when to use them at times the bees are less active. Don’t take any unnecessary risks. Some issues you may encounter with using bee sprays include residue and staining. We suggest trying them on an inconspicuous spot before widespread application. Check to see if it is water or oil-based. The former is easier to clean up whereas the latter is more of a headache after the fact. Yes. However, it’s essential to balance the pros and cons. If you or someone in your family is allergic, the choice is clear. You have to protect your loved ones. After all, one of the only ways to prevent a reaction is to avoid them. However, in the interests of the environment, you should use them for infestations in your yard and not as a preventive. Many of these products have a residual effect so that you are less likely to have a recurring problem. However, you also have other options too. An excellent compromise between your safety and the benefits of honeybees is to follow our suggestions below to avoid having to deal with a problem altogether. Alternatively, you can contact your local extension service to find a beekeeper who can remove a nest and spare you the worry of killing beneficial insects. Prevention is probably the best solution of any we’ve discussed. Many of the tips will sound familiar if you’ve dealt with other pests such as rodents. The first thing you need to do is to seal any openings in your foundation or crevices under the siding. Bees routinely scout areas for likely nesting places. Don’t make your home one of them. Clutter in your yard can also provide suitable areas for them to use. Remove any trash or potential hiding spots that can provide the shelter that they seek. Anything can provide a possible location even in the most unlikely of places. All they need is somewhere to build a nest. It’s essential to remove the honeycomb of an abandoned nest too. It acts as a billboard to attract other bees in the area to a potential site. Remember that prevention is infinitely easier to do than getting rid of a bee problem—without the added risk of getting stung.